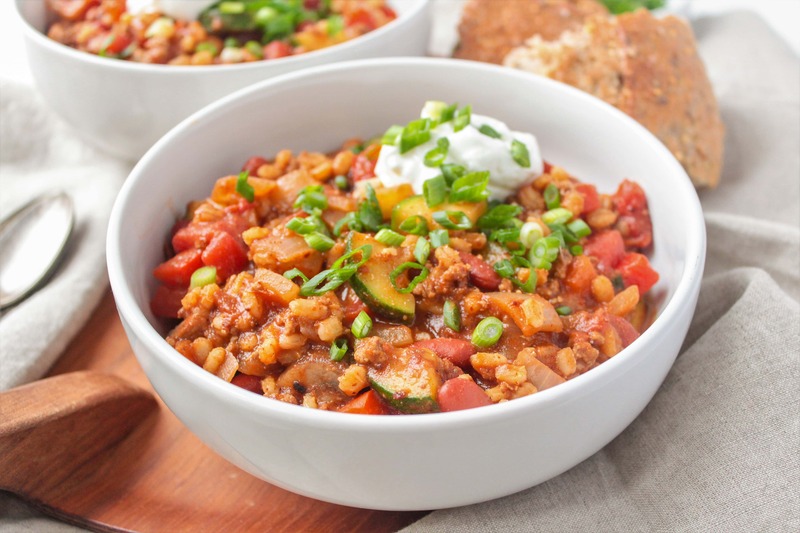 This Turkey, Veggie, & Barley Chili is hearty, filling, and full of flavor! 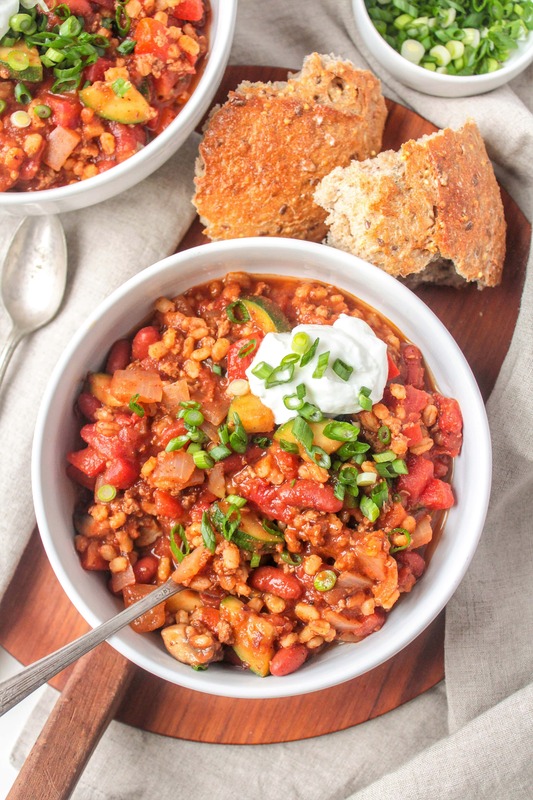 Chili is one of my favorite comfort foods for chilly nights, and the combination of turkey, barley, and tons of veggies makes this chili the perfect meal for when I’m craving something cozy but not too heavy. Click here to pin this image on Pinterest! 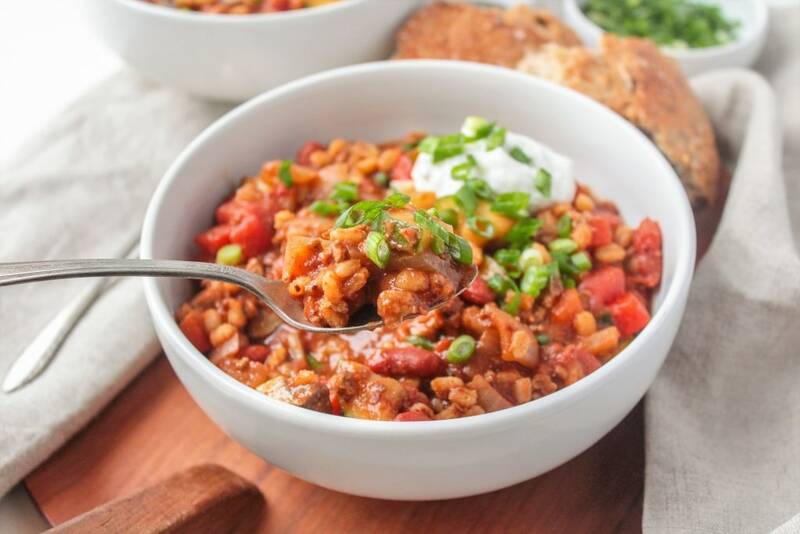 The barley is my favorite addition in this chili – the chewy texture is super hearty and satisfying, and adding a whole grain to the recipe makes this chili super filling and high in fiber. 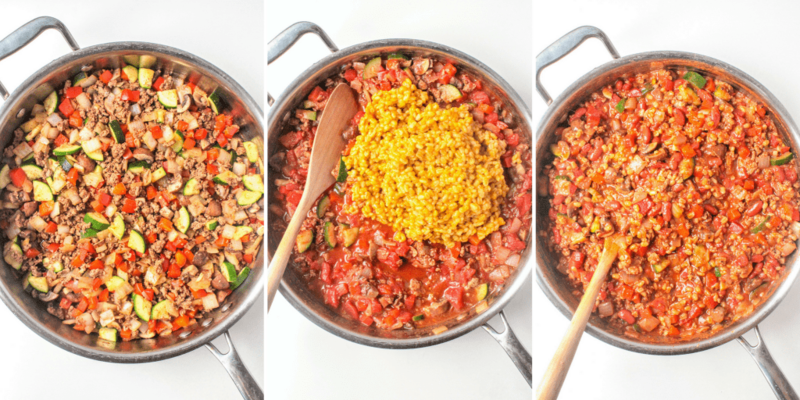 I also love all the veggies packed into this chili, making it colorful and full of nutrients. All together, it’s a well rounded and healthy meal that definitely keeps you full and warms you up, but doesn’t leave you weighed down. This chili is super easy to make, too! Start by cooking the barley – since it takes a little while to get tender, you can prep the remaining ingredients while it’s cooking. Then saute the veggies and turkey, add canned tomatoes and spices, and stir in the barley once it’s cooked! You’ll definitely want to get some tupperware containers ready for leftovers, too. 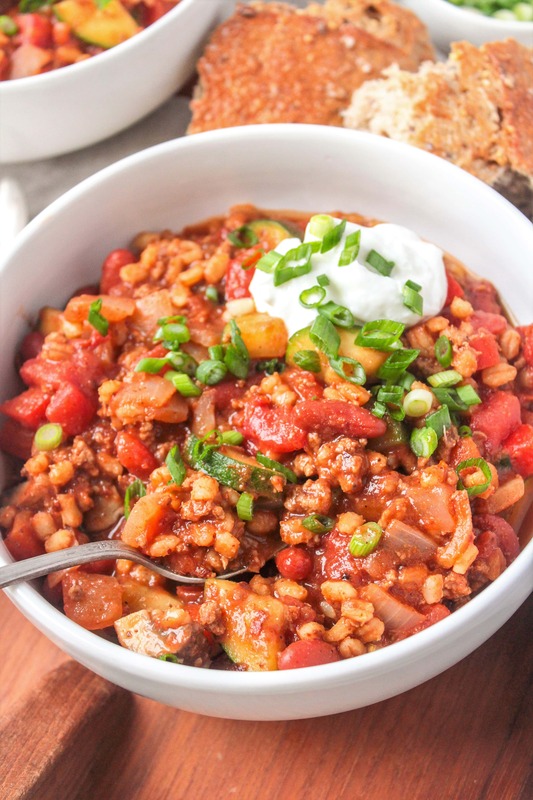 This recipe makes a ton of chili, but I think it tastes even better heated up the next day! Combine vegetable broth and barley in a medium pot. Bring to a boil, reduce heat to low, cover, and simmer for about 30 minutes, until barley is tender and most liquid is absorbed. While barley is cooking, chop all veggies and prep remaining ingredients. Heat olive oil in a large pot or saute pan with tall edges. Add ground turkey, garlic, onion, bell pepper, zucchini, and mushrooms. Saute until turkey is fully cooked and veggies are tender, about 7-10 minutes. Add remaining ingredients to the pan, along with the barley and any remaining broth once it's tender. Stir all ingredients together and cook until heated through. Looking for more awesome chili and soup recipes? Here are some of my favorites! Previous article: 2010 Year in Review: Part 2! Regarding the cutting board (which does look beautiful in the photos), I have a dark wood cutting board that I reserve just for pictures – don’t chop anything on it. That way, it won’t get knicked up. I cut on a plastic board and transfer for photos as necessary. I think life is too short to not actually use my nice cutting board :) I hear you on not wanting to mess it up, but it just felt so much better and easier to cut stuff on it than on my plastic one! Solution: Get two nice cutting boards :). Or, like, five. I LOVE having leftover soup in the freezer. I use freezer ziplocs, fill them 1/2 to 2/3 full, and then lay them flat in my freezer. Then, when they’re frozen, they take up less space and stack oh-so-nicely. Mmm… chilli is so delicious! I think the best way to freeze it is to buy small freezer bags and put one serving’s worth of chilli in each bag. Then make sure to freeze them as flat as possible. You can stack them in a nice column in the freezer and you have perfect frozen meals in the event of a busy day. It’s great for lunches because they can thaw during the morning and then be heated at lunchtime. That chilli looks and sounds SO GOOD I might actually try to cook!! I also think as soon as I pay off my MBA student loans I am going to try to become you, Anne, and go to UNC-Chapel Hill for an MPH– I love your classes! Sooooooo cool! The chili looks delicious. I made a big pot of chili Sunday evening anticipating the snow and ice storm. 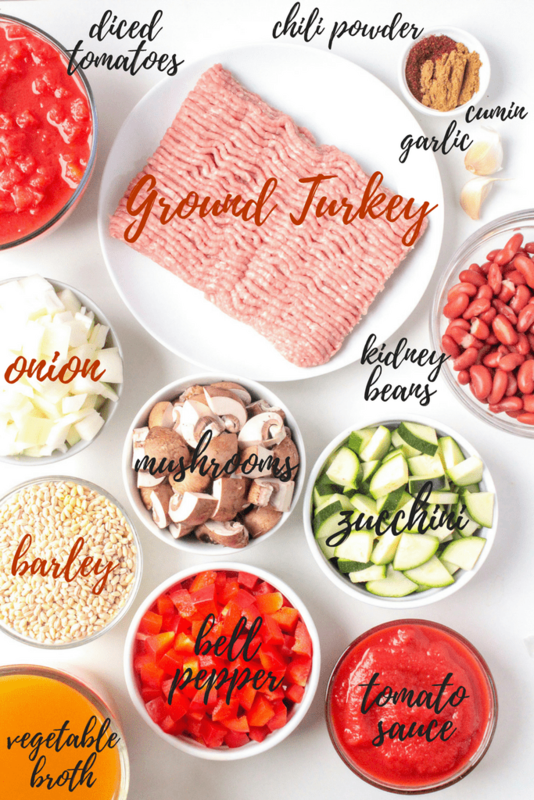 I have never used ground turkey, I have always used ground chuck or sirloin. I will give it a try next time. I love barley, but never thought to use it in my chili. Great idea. It looks like your weather forecast is better than Atlanta’s. We are still stuck in the house and it iced over last night. High yesterday 29, high today 30. I have cabin fever, HELP. I am like you, I would use the nice cutting board too. I don’t save things anymore, I use them. Good luck on this semester. 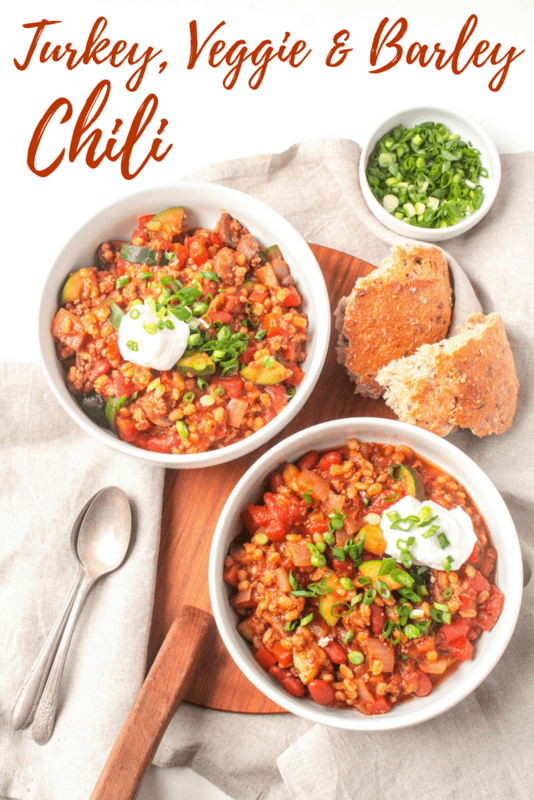 Barley in chili sounds amazing – I was thinking how I need to make my favorite chili recipe soon. I love the cylinder ziploc containers to freeze things in – you can buy taller or smaller 1 serving sizes. We are supposed to get 16+ inches of snow tomorrow so I am hoping to spend some of my day cooking as well. I freeze chili in big tupperware or Glad containers. Not Ziplocs. That sounds messy. Barley is on my list of things to try. Lentils too! I avoided all science stuff in undergrad, and was terrified of them starting prerequisites for this program – surprised to find they weren’t bad! Ah good luck in biochem! I just took it last semester, and it was by far the hardest class I’ve ever taken. Enjoy! You could probably add some other beans as a meat substitute if you wanted to go vegetarian. I buy little freezer friendly tupperware. You can get portioned ones (~ 2 cups each) and then they are perfect for a quick meal! i like freezing in tupperware. it’s easier to divide soup into smaller amounts to freeze so you only have to thaw 1-2 servings at a time! that chili does look delicious – i just “starred” this post in my google reader to make soon! Yum. I love switching up what I put in my chili and barley sounds like a fun addition. I have a ton in the pantry which is making me think I should try that. I’m also considering millet and some of the other wacky grains I have in the cabinet. And you are so making me miss classes. And snowdays. mmm that chili looks so bomb!!! I always love trying out different variations of chili! Great idea of putting the barley in there! Holy crap that chili looks delicious. My cutting board is in all of my photographs, my brother made it for me a few years ago and it’s my favorite! Delicious chili! I freeze soups and chili in ziplock bags, they stack easier in the freezer…and easy to thaw as well. That dish looks awesome!! I’ve been eyeing barley for some time now and I might just have to try it out now. I do love orzo, so it might be a love-match for me. Glad to see you’re back home after all that traveling! I was so happy to stumble upon your blog and find that you attend UNC! I’m an undergrad and I love it here. Your pictures are so colorful…I’m definitely going to add fannetastic to my list of must-read blogs. How long is your program? 5 classes is a lot but at least you will be busy! I’ve got 4 classes this semester which isn’t bad. Anne, love your recipes and picts! I nominated you for a Stylish Blog Award! Looks scrumptuous! Good luck in the semester ahead! Mmmm looks delish!! What kind of veggie broth do you use?? Oh goodness do I ever love a good bowl of chili! Great recipe! Hearty and healthy but most of all, tasty! I made a few tweaks (left out the beans, sauteed the mushrooms, added red pepper flakes). Thanks so much for this. I now have lunches for an entire week! You just made my day!!! I’ve been loking for a similar recipe to your turkey chili. Your adaptations will solve all the problems I had with my previous recipe. Can’t wait to try it!! !